Jerry’s Bait Shop is not the kind of place you would go if you actually wanted fish bait. 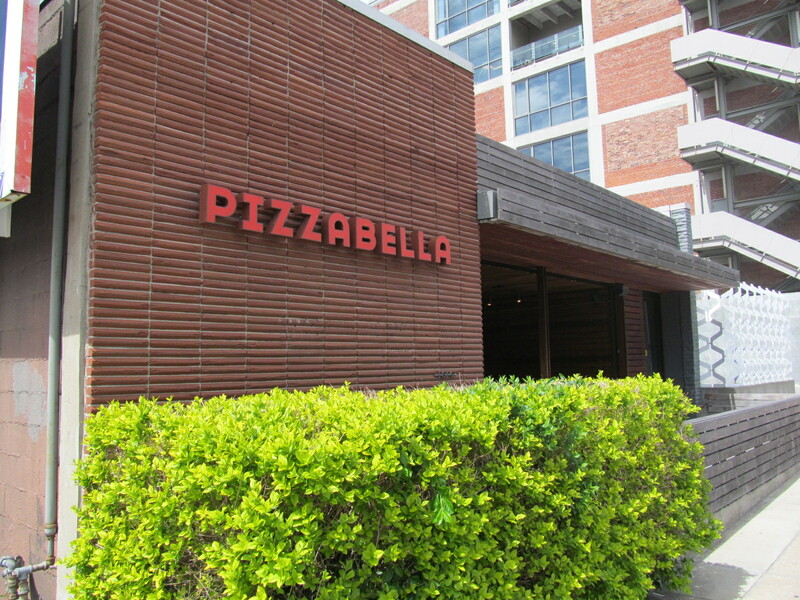 It is the kind of place you would go if you wanted a cold drink and some tasty pork……in the form of a pizza, that is! Jerry’s Bait Shop has the feel of local small town tavern in the heart of metropolitan Lenexa, Kansas. Jerry’s is located on Santa Fe Drive in a building dating back to the 1870’s. You can almost sense the wagon trains that would pass by out front…..or you can enjoy the sight and sound of the actual trains which run just across the street. With a historical aspect in mind, Jerry’s Bait Shop is highly reminiscent of Sharkey’s Pub and Grub in Fort Scott, Kansas, with similar décor, atmosphere, drinks, and menu. At Jerry’s Bait Shop, you can get a pizza any way you want it. I want mine with all the meats! I like to order The Lunker, a pizza that includes pepperoni, sausage, Canadian bacon and regular bacon. If you would prefer, they offer a pulled pork pizza, as well. If you find yourself in the Kansas City longing for someplace out of the traditional big city hubbub, tell your friends you need some bait, and head out to Jerry’s Bait Shop in Lenexa. Be sure to check the place out on weekends, when they feature live music! If you like the concept of places like Qdoba or Chipotle, but want pizza instead of tacos, go check out MOD Pizza when you get a chance. MOD Pizza is a Seattle-based chain that was started by husband and wife Scott and Aly Svenson. They call their product “individual artisan style pizzas” and the way it works is they build it right on front of you just like the burrito shops; the only difference is the pizza then goes in a wood-fire oven for a few minutes after it’s assembled. Now branching far from Seattle, MOD recently moved into the shopping and dining area near I-35 and 151st St. in Olathe (20152 W 153rd St, Olathe, KS 66062) so it’s very accessible from some major roads. They also have locations in Missouri in Raymore, Liberty, and North KC. I timed the process on my stop at MOD Pizza, and it was about 8 minutes after I paid before my pizza was ready. I had time on my hands, but it looked so good I couldn’t wait and got a good case of mouth roof peel from my piping hot pizza, but it was worth it. The pizza is very good. The crust is crisp, yet a bit chewy still and the toppings I had were very good quality and had great flavor. I had sausage, bacon, and Canadian bacon along with some mushrooms and black olives on my pizza. The subject of toppings leads me to another cool thing about MOD Pizza. No matter how many toppings you choose, the price stays the same ($7.87 plus tax at the time of my visit). With over 30 toppings to choose from and a set price, the flavor combinations are practically endless and also wallet-friendly! I think the idea of a flat rate is pretty neat, because you can only fit so much stuff on a pizza, so if you want 12 different things on it, you just don’t get a lot of each one, but all the flavors are there and you don’t get gouged for 50 cents per topping like some other places. All in all, MOD Pizza appears to be a great mixture of the speed and fun of the burrito places with the satisfaction of a nice wood-fire pizza as your meal. When affordability is considered, I see MOD Pizza as a strong player going forward in the new “artisan” fast food scene. If you are in the mood for pizza, but possibly wanting something more unique such as Chicago deep dish pizza, then look no further than Rosati’s Pizza in Overland Park, KS. Around the KC metro, Rosati’s is known as one of the few places that Chicago transplants will trust to feed their deep dish cravings when they’re feeling a little homesick. If “deep dish” isn’t your thing, you are in luck, as they have all other styles of pizza too. Hot sandwiches, calzones, pasta, and Chicago-style hot dogs are also on the menu if you’re not in the mood for pizza. On my latest stop I had a small “deep dish” pizza with Canadian bacon, sausage, and regular bacon on it. Carry-out deep dish pizza doesn’t photograph very well, but that thing was an incredible combo of pork, cheese, sauce, and buttery crust. Those pictures don’t even begin to describe how good that pizza was! The one knock on Rosati’s is they are carry-out and delivery only because there is no seating inside. But being located at 9928 College Blvd. (just west of Hwy. 69), they are very close to Corporate Woods, the Overland Park Convention Center, and all the surrounding hotels. If you ever find yourself in the area and want something different and better than the usual delivery food to eat in your hotel room, consider Rosati’s! Dewey’s is a small chain with other locations in St. Louis and scattered throughout Ohio. The Overland Park location offers a modern vibe and a good location. We went during suppertime on a Thursday, and the place was hopping! Our server indicated that we could get any pizzas on the menu in whole or half and half combinations or any custom combination we wanted. Of course, my half had to have the pork….and lots of it! I ordered the Don Corleone, featuring red sauce, mozzarella, pepperoni, Genoa salami, capicola ham, and oregano. This pizza was good. The refrigerated slice I ate cold for a midnight snack was even better! I’ve been told that another “can’t miss” is the Porky Fig which has fig jam, mozzarella, fontina, prosciutto, caramelized red onions, and Gorgonzola. I’ll have to try this one on my next visit! As I mentioned, if you are a pizza lover in Kansas City, you have lots of choices. Why not give this Dewey’s Pizza a try?! Artego Pizza, located at 900 W.39th Street in Kansas City, (in the same strip as Q39) is a phenomenal joint. According to their website, they are “not your average pizza joint and not your average crust.” They then go on to explain something about fermentation and spice blends…. I’m not a food scientist, but whatever they are doing certainly works great. The crust is delicious and the pizza is as beautiful as it is tasty. The drink menu includes an extensive list of beer and wine to wash down all the deliciousness of the pizza. Be prepared for loud rock music, which is fitting given the huge paintings of the rock and roll legends adorning the walls. The artwork is for sale, if you like it as much as you’ll undoubtedly like the pizza. 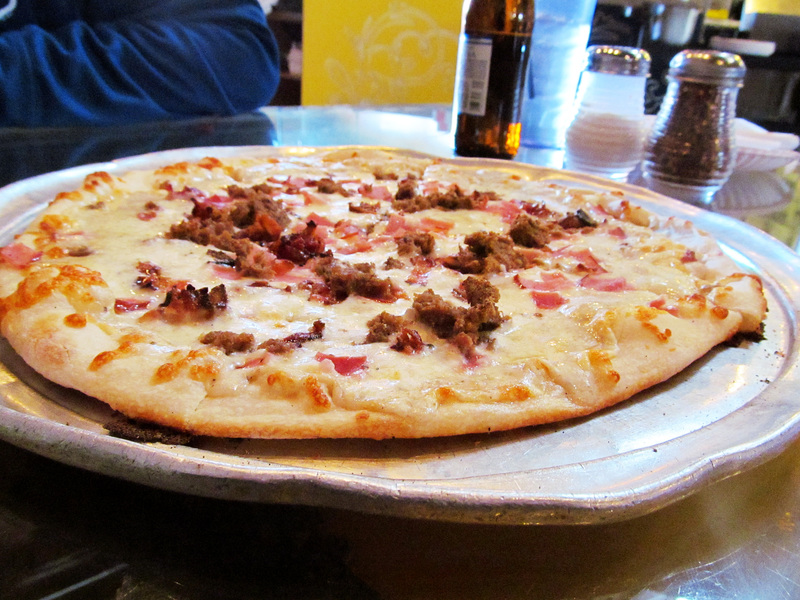 For the pork lover, I recommend the Stockyard, which includes pepperoni, salami, Scimeca’s Italian sausage and bacon. If that’s not enough pork, they also offer Canadian bacon. If you like cold drinks, rock and roll and great pizza, you’ll love Artego Pizza. Pizzabella, one of Kansas City’s very best locally owned pizzerias have two locations in the area serving up some serious pizza pork. The original location is in the hip Crossroads district just south of downtown Kansas City, and the newest location, opened in 2013, is located in the Mission Farms area of Overland Park, Kansas. The name is French for beautiful pizza. The story, as it was relayed to me, is that the owner, a small-town Kansas guy, always wanted to be in the restaurant business. He was able to buy the Crossroads location from his former employer and has been fortunate enough to expand to a second location. Whatever the story, the wood fired pizza is excellent; but then again, I’m yet to find a wood fired pizza that isn’t! I shared a delicious chorizo pizza with my cousin Sterling, a Kansas City pizza aficionado. We ate at the original location which features garage door design that allows nearly the entire front end restaurant to open up during favorable weather. Our pizza included fresh tomato, basil pesto, pork chorizo, roasted red peppers, ricotta cheese and parsley. 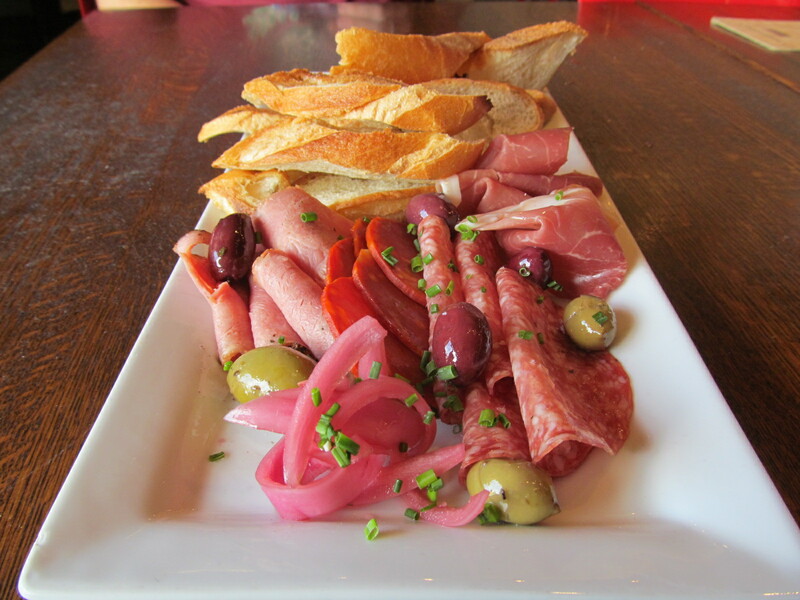 Some of the other pork menu options include a charcuterie plate, a sausage pizza and a Prosciutto pizza. The name of the restaurant was certainly reflected in our beautiful and delicious pizza. For more information on other great Kansas City area pizzerias’ check out our blog entries for Spin Neapolitan Pizza and Grinder’s Pizza. 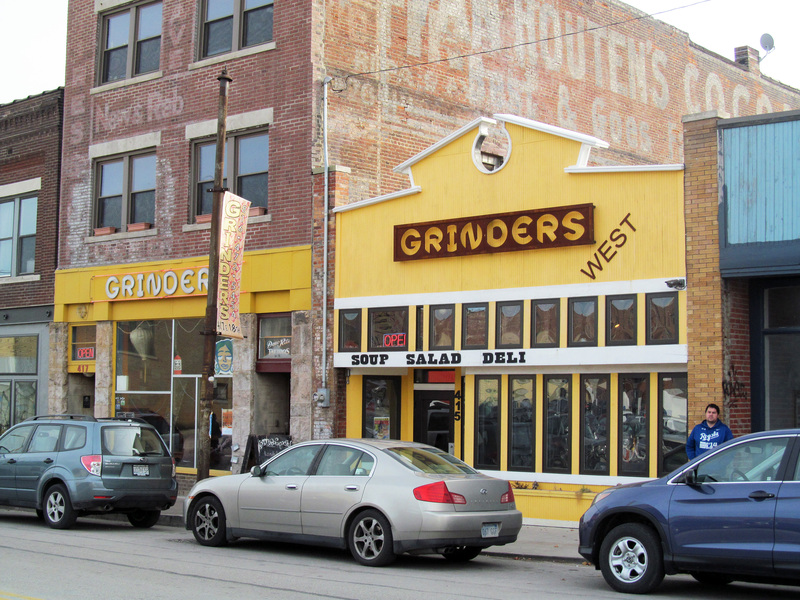 They have another restaurant, Grinders West, located immediately next door. Directly behind Grinders is the famous Crossroads, an outdoor music venue featuring some of the music industry’s most famous acts. This place is a one stop shop for cool. What is even cooler? They have a pizza on the menu called the Le Hog. It would be pretty hard to pack more pork onto a pizza than you can get with the Le Hog. They also have burgers, wings salads, and an extensive drink menu. Additionally, Grinders has been featured the Food Network television show Diners, Drive Ins and Dives and the Destination America television show Barbecue Pitmasters, where they proudly represented Kansas City Style barbecue. The Le Hog is delicious, the beer is cold and the concerts rock. This is a place in Kansas City you can’t miss.